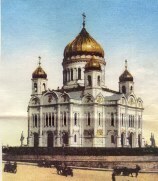 In 1994 work began on the reconstruction of what was considered to be one of the most powerful symbols of Russia's spiritual identity and nationhood - the Cathedral of Christ Our Saviour which was destroyed by Stalin in 1931. The rebuilding of the church was the centerpiece of a huge renovation scheme in the Russian capital pursued by its mayor, Yuri Luzhkov. During a ceremony to lay the cathedral's cornerstone Luzhkov said "Let the reconstruction of the main cathedral stand as symbolic proof of hundreds of destroyed churches and millions of lost lives". The cathedral has been rebuilt on the site of the Moskva Open-air Swimming Pool, opposite the Pushkin Fine Arts Museum, where for thirty years Muscovites have swam, all year round, in the world's largest open-air swimming pool, where the water was kept at 27 C even in the depths of the Russian winter. Swimmers were protected from the subzero temperatures by the eerie blanket of steam rising from its surface that also shrouded the local neighbourhood. Whilst a generation of Muscovites swam here, perhaps in the belief that cleanliness is next to godliness, the swimming pool was the site of one of this century's most notorious acts of desecration. But it was not the only such act to take place on this site. In 1812 Tsar Alexander 1 ordered the construction of the cathedral to mark Russia's victory over Napoleon and gave the order to destroy the Alexseyevsky monastery which was to make way for the construction of the mammoth temple. The nuns of the convent were so strongly opposed to the destruction of their convent that, as legend has it, the abbess cursed the ground on which the cathedral was built. Construction began in 1839 on the site of the Alexseyevsky monastery but it wasn't until 1883 that the cathedral was completed under Tsar Alexander III. It was designed by 19th century architect Konstantin Ton whose plans for the triumphalist cathedral were implemented by hundreds of artists and engineers, thousands of builders and funded by the donations of thousands of private contributors. The result was a rather pompous and bulky monument to Russias imperial strength. Bulky and pompous it may have been but, it was nevertheless very impressive. It was less ornate that the numerous 17th century churches around Moscow and less original than St. Basil's in Red Square but far larger than any of them. Thirty stories high, with walls 13 ft thick, the cathedral's copper-guilded dome dominated the Moscow skyline. The wealth of the interior of the church was also impressive. Its marble and granite interior was illuminated by the light of 3,000 candles whose gentle glow flickered over the numerous icons, frescoes and golden ornaments. On December 5th, 1931 Moscow was rocked by powerful detonations, then a terrifying silence. A heavy cloud of dust and smoke hung above the city and a smoking mountain of rubble lay where the cathedral had once stood. Twice that day he explosives failed to bring down the main tower. 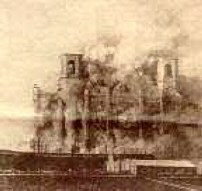 Believers in the crowd of spectators said the Lord would not allow the church to be destroyed. But the third explosion brought the whole structure collapsing to the ground. After the Bolshevik Revolution in 1917 he communists imposed their official policy of atheism on the Russian populace. This probably had less to do with their ideological opposition to the "unscientific" basis of religion but more to do with hatred of the Orthodox Church because of the close relationship between the Orthodox Church and the Tsarist state and the role it played in Tsarist oppression. The separation of church and state was not enough for the Bolsheviks, churches were closed, many were destroyed and looted, icons were smashed and the priests arrested, tortured, or executed in the years that followed the revolution. By 1931 there was perhaps no other structure that so stubbornly represented the imperial power and spiritual leadership of the ancien regime than the Cathedral of Christ the Saviour. Stalin decreed that the cathedral be destroyed and in its place would be built a giant Palace of Soviets, glorifying communism, taller than any other man-made structure ever built (taller than the then tallest building the Empire State Building) . It would be a 1,378 ft wedding cake crowned by a massive statue of Lenin which would stand three time the size of America's Statue of Liberty. Construction began on the project and the foundations were built by 1938. But it was soon discovered that owing to dozens of underground natural springs the foundations would never support such a giant mass of stone. Meanwhile, the great industrialisation projects on the onset of war diverted scarce resources from the building of the palace and its construction was put on hold. After the war there were still to many pressing problems reconstructing the country. The plans to build the giant palace were quietly dropped in 1959 and construction on the open-air swimming pool began. The reconstruction of the new cathedral began in 1994 using the latest technology and construction methods - composite materials, corrosion protection, telecommunications, air-conditioning, elevators and even underground parking. 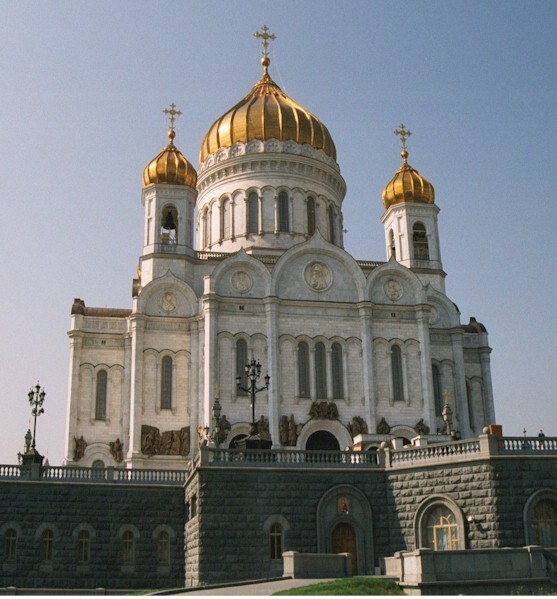 The ceremony of consecration of the completed Cathedral was held on 7 September 1997 during the celebration of the 850th anniversary of Moscow. "No construction project has embodied more of the grandiosity and hypocrisy of the resurrection of Russia than the rebuilding of a cathedral that had been looted and dynamited at Stalin's order in 1931". The rulers of Imperial Russia and Soviet Russia both sought to construct a mammoth monument representing the might of their respective empires. With both empires now gone, the reconstruction of the Cathedral of Christ the Saviour may simply represent the rebirth of a nation.